Jeff has been living in this tiny house about 100 days out of the year, with his wife and dog, while building their larger 1,400 square foot home. Their property, which they bought in 2003, is in the western mountains of North Carolina. Jeff figured that they could camp out while building the larger house but soon discovered that their new property was in a temperate rain forest, which meant regular rain and very uncomfortable camping. This tiny house was born out of the desire to stay dry and warm. He prefabricated the tiny house at his shop two hours away and brought it up in pieces. It’s built from a lot of reclaimed building materials which kept the cost low, probably in the neighborhood of $1,500. He suspects that with labor costs a house like this could be professionally built for less that $9,500. The passive solar design keeps the interior about 20 degrees warmer than the temperature outside, even with snow on the ground. It measure 8′ by 8′ has a marine toilet and queen bed. It has no running water or permanent connection to the power grid. But it does have a nice little outdoor kitchen on one side with a Corian countertop and handy water spigot. Eventually it will serve as a garden shed but today it’s a comfy place to rest on work weekends. One weekend he arrived and found a note on the door from the county saying he had built the shed in a floodplain. As a former building inspector himself Jeff had figured that the tiny house wouldn’t attract attention because it didn’t fall into the definition of a habitable room, which in his neck of the woods is 70 square feet. He was partially right, the location of the house in the flood plain is what raised eyebrows. Luckily there was no bed or TV in the room either when the inspector visited. This seems like a good lesson to learn, the more a tiny house looks like a garden shed the less attention it attracts. Hide in plain sight in other words. So Jeff picked the house up with a forklift and put it on a tall concrete block foundation to satisfy the counties concerns and avoid further inquiry. It’s surprising to me that the building inspectors cared at all about a ‘shed’ that didn’t need a permit to be built in the first place, but you never know what red-tape you’ll run into. Every community is different and every building inspector will have a slightly different take on interpreting the rules, it’s just an unfortunate reality. The photo above also shows the detail of the front of the house well. Notice the pyramidal roof, the low walls to the sides of the door, the large windows and the curved portal roof. These design features are what give this simple box house so much character. The interior walls must be fairly low but I suspect the interior ceiling height is generous under the pitched roof. The over-sized windows also provide the excellent solar gain without making the house look too much like a solar house. Outside they’ve planted a garden for fresh veggies on their weekend work trips. Jeff has also begun to use several different passive and active solar techniques on the larger home and tiny house. Eventually he wants to have a photovoltaic solar array and a wind turbine for electricity. The biggest passive solar recommendation he has for those of us interested in building our own solar tiny houses is to make it as air tight as possible. He went to great lengths to make both houses air tight and it makes all the difference. Below is the river (and dog) you’ll find in their backyard. The nearby river is the reason this tiny house, and larger house, are built so high in the air. Photo credit to Jeff & family. Be sure to check out his photos on flickr. 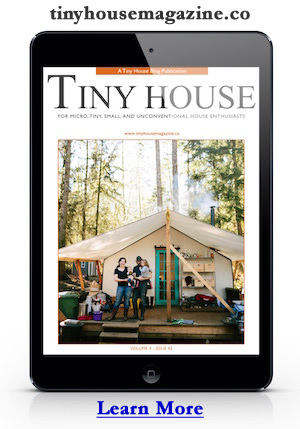 This is a wonderful tiny house design success story! Thanks for all the great information Jeff! This entry was posted in Tiny House Projects and tagged cabin, jeff, shed, tiny house. It’s so beautiful. I’d wondered about the concrete blocks when I saw the photo on flickr, I’d thought maybe underfloor storage was the purpose. I love how it looks up on the blocks though. Very unique. What the heck is a quartz heater, though? I think a quartz heater is an electric inexpensive infrared heater. No something you’d use with an off the grid solution. Jeff has grid power. Congratulations! This is the most beautiful tiny house I have ever seen. I am a Crazy person about tiny things like tiny car, house… But wondering what kind of electricity you are using there? The revenuers inadvertently did you a favour if you truly are in a floodplain and it looks even better now that it is perched on the cinderblocks. I wish you would put out photos of the inside too. Thanks for sharing. Reminds me of how my wife and I have lived and traveled for years – our “house” is only about 72 square feet if you count the dash! FASINATEING…n how TRUE on inspectores! I am building a tiny dome “Hobbit Hut”. In grnd. Will cost MABY $350.00 when done, includeing “furiture” n “fireplace”. Close to compleat. Sleeps 2 adults/baby n small child (on floor). Nxt will b a compainion dome Bath / Tolit area with lots of storage. Inspector asked what I was building ; “Root Celler with boys camo-out possabilitys”. OH…ok. START of project can be seen (scroll down) on HUB (by Ghost); MAKE A SERVIVIL CABIN ON A SHOESTRING BUDGET. Sounds like a great project. Love to tell the story if you’d like to share photos and info. Thanks Red Elk! Mitchael; Im a PC “Day”. Whats on Ghosts’ Hub i had 2 send camars shots so he could scan to his PC. (I mean; DAH)! Rite now the miny Hobbit (?) hut / Gnome (?) home nearly done. N i was “rite on the money”….$350.00. THAT because i decided to “fancy it up”. MANY comments from visitors…aged 10 to low 80s. As many men as gals. a FEW comments ; “I WANT ONE”…”this is CUTE”…”oh WOW! IVE GOTTA BRING MY KIDS TO SEE THIS!”….n on n on. I built because of a # of reasons; #1, to give HOPE to the economily hit homeless..#2; to SHOW “outside the box” thinking can “do” amazeing things…#3; to PROVE Nature(el) materials can b used…#4; Rd.side “finds” CAN be usefull, not “trash”…#5; Wife has wanted a Root Celler, Grandson wanted a “big Camp=-Out tent”…#6; I want a “quit place” to meditate…AND to exscape 7 “mouthy” Chauchuchus’ (Cute but DANG r they NOISY! )…#7; 2 Prove todays “green” “All has Presidents’ faces on um”. (IE; Rapeing Nature to “Save” Nature). DIRT IS ALLWAYS DIRT…no killing, just MOVEING. Had 2 b small as allmost the whole thing is done alone….68 in June, Amputee , 1 heart attack , 3 strokes….BUT: if I can do it, just about ANY can. Aho? (Understand?). MINY In Ground (1/2) “Hobbit Hut” / “Gnome Home” is DONE! Rug in. Tiny touch up…2 b done at my leasure…n, well, I will then b happyER. A friend spent half the day in it 2day n will ditto 2nite. Came in all smiles. “It is GREAT!” 45 yrs old, 6 ft even…male. WILL SEND PIC.s when I can afford to develipe / send (dont know how to do on PC). Yesterday my 14 yr old grandson / i / n 45 yr old friend, built a Basic Servival hut. Took us 4 HOURS…cost? ; O! STRONG / WEATHERPROOF. Firepit inside (center) for Heat / Cooking / Light. Sleeps 3 with back packs n STILL rm. to “roam”. This nxt to Hobbit Hut towards back. Working on #2. Friend wanted to learn / use. We can use for storage or after the other 2 r “as one”. a tiny VILLAGE out here! BOTH r FAR BETTER THEN ANY TENTS. I, and I’m sure, others, want to see the pictures of your hobbit house when you send them in. Sounds interesting! Pretty cool place. Where are the neighbors? I am concerned about all the self congratulations about avoiding permits – yes, they are a hassle, but they also do things like protect watersheds, ensure human safety (for others, not just you) and so on. Also – once you move out, you’ve still got a footprint/impact on the land and not much chance for re-use (not to mention re-sale). I love tiny house concepts but I don’t love congratulating ourselves on getting around laws that protect fish, water, ground conditions, access, and safety. The permit laws don’t “protect fish and water”, they attempt to regulate a risk we should we permitted to take on ourselves: is it in a flood plain? The owners of such a building are grownups. The inspectors have no business stepping onto private property to demand a private building be raised up. The world does not need any more defending of permits and rules. I’m with all the people doing EVERY SINGLE THING WE CAN to get around permits, fees, inspections, and on and on and on. If you think it’s about health and safety, where have you been? Not in California where I have lived almost 70 years. Sure, Red Elk is putting a footprint on the Earth. It sounds like it’s a lot more interesting–and about a thousand times less intrusive on the environment or anyone other than Red Elk’s family and friends–than any McMansion north of Montana in Santa Monica–and every one of those passed inspection. Congratulations, whether self-given or other-given, are ABSOLUTELY due to anyone getting around the ridiculousness of modern so-called planning. Remember less government and more rights is the best form of government. I believe if you live in the country you should not need any permits except for a sepitic tank, the property should only be taxed for its value and its contents. As for flood zone only common sense would tell you not to build too close to a creek or river. can I have it when you move to your bigger house? Oh, come on! Show us the inside!!! I think it’s a wonderful little building. @ kb, your comment shows me you may be an inspector or work for town or state government. Or just trust in them explicitly like so many people do. Building codes began when put government had good intentions, protecting against unsafe living conditions and pollution, etc. however, codes are no longer purely for that purpose. I live in New England. Many many homes are as old as the early 1700’s or even late 1600’s. they stand solid as a rock, on huge slabs of granite made with 12″+ beams. They put most modern buildings to shame. If you try to build that way now, there are many hoops to jump through and much red tape to wade through. It’s ridiculous how strict they are and it’s all about keeping manufacturers wallets fat. This is how we ended up with so many people leaving debt to their kids instead of an inheritance. Or reverse mortgages (which in my humble opinion are a horrible idea) and foreclosures an homelessness. I’m speaking from experience. I’ve been researching natural/tiny/off grid solutions since my house wa foreclosed on after 20 years of paying a $1100 a month mortgage. I’m a single mom who had 3 major surgeries in 7 years for job related injuries. I’m not irresponsible, it’s the way of our economic world. It’s long past time for a change, time for local government to get with the program and start thinking about people instead of corporations. I just love these small houses and i’m praying some day me and my husband would love to go back to w.virginia . with a plan to get a small home. I just love it!! You are very talented. Oh boy, I wish I were, I have always loved tiny spaces! I could see myself right comfy in a small home similar to this, with a cat curled up on my lap as I read a good book. All by a lake, of course! The little house was posted on my Facebook newsfeed, but all we got to see was the outside in a couple of pictures. All the rest of the pictures were of the big house– mostly of the outside. I clicked on the little house because I wanted to see IT, not something else I would never have clicked on!